At the Dubai International Boat Show, the most exclusive and luxurious date on the season's boating schedule, the Group will be exhibiting 16 yachts at a 600-m2 booth. The Azimut Benetti Group will land at the Dubai International Boat Show, which is open in the pearl of the UAE until 5 March, with the objective of seizing the opportunities presented by a market that is proving to be particularly vibrant. For the Company, headed by Paolo Vitelli, the UAE and, in general, the countries of the Middle East have expressed the capacity of economic recovery that is more significant than in the Group's other traditional markets. In this regard, it's worth noting that in this very area, Azimut Yachts has nearly tripled its order portfolio in the last six months, while for Benetti, which operates in a sector where sales are distributed over greater time spans, the Middle East market today represents about 20% of total sales, vs. 8% just two years ago. The recent path that brought Benetti to this brilliant performance consists of the delivery of three mega yachts in the past 12 months, a record that no other yacht builder has succeeded in matching in this area. The new Back Cove 30 motor yacht is set to make its Australasian boat show debut at the Sanctuary Cove International Boat Show, 19-22 May 2011. Emarine Australia, exclusive Australian importer of Back Cove Yachts, will have both the Back Cove 30 and Back Cove 37 on show and the company is looking forward to a positive event. Emarine principal Jed Elderkin said he had seen an encouraging start to the year so far. Cigarette Racing Team's Skip Braver believes that the word "Team" includes his strong dealer network--both internationally and domestically. At last week's Florida Powerboat Club's 16th Annual Miami Boat Show Poker Run to Islamorada, several Cigarette dealers participated with gusto! David Woods from Pier 57 in Tennessee, representing both Cigarette and Marine Technology Inc. (MTI), took several boats and the group earned four awards: Best V Bottom - Ron Harrison, 46 Cigarette, Mercury Racing 1350, Best Paint & Graphics - Albert Haynesworth, 48 MTI - Terminator, Mercury Racing 1350 Most Outrageous Boat - Derek Wachob, 48 MTI - ZR-48, over-the-top customization (also owner of a Cigarette Top Fish with quad 350 Verado engines). Phil Lipschutz of Lip Ship Performance, Cigarette's long-time Miami dealer, was also at the Poker Run with his brand new Cigarette SS 50' Marauder that just made its debut at the Miami Boat Show. The first 50' built for the US with Mercury Racing 1350's tore up the waters, showing the acceleration and smooth speed that make this powerboat the most amazing Cigarette seen in 40 years. He will use the new 50 as his Bastian Breuer, Cigarette's German dealer from Maranello Marine also made the Poker Run and found it the perfect way to wrap up his trip to Miami. Over 65 boats, 9 were Cigarettes, including the pace boat, the 46 Cigarette "Merrittorious," piloted by brothers Michael and Keith Merritt, from Ohio competed in the Poker Run. This "one-off" Cigarette was documented as the fastest Cigarette at 172+ mph in a kilo run in 2006; it was completely transformed into a recreational powerboat and makes many events on the poker run circuit. Cruisers Yachts, one of the world’s premier manufacturer of luxury yachts, has been awarded a Best of the Year award by MotorBoating in the category of Interior Design for its 48 Cantius Sports Coupe. The new model couples the elegance of a mega-yacht with the practicality of an express hull and marks the beginning of a new era for Cruisers Yachts. Each February MotorBoating selects an exclusive group of boats, electronics, engines and gear that enhance and change the landscape of the boating industry. The 48 Cantius is the first of a new line of models and Cruiser Yachts is pleased to announce renderings for a 41 foot model will be introduced in July 2011. The company has seen an increase in sales at both the wholesale and retail level since the debut of the new yacht. The award, presented at the 2011 Miami International Boat Show, was accepted by Pedersen, Stock and Jon Viestenz, product manager of Cruisers Yachts. In addition to the MotorBoating award, the 48 Cantius was named “Queen” of the 81st Annual Chicago Boat, RV & Outdoors Show held Jan. 12-16 and was featured in national publications including Boating, Power & Motoryacht, Southern Boating and Yachting. The latest edition of the meeting, which involved 130 participants from all over the world, ended on 18th March at the Kempinski Palace Hotel in Portoroz, Slovenia Once again captains of yachts and ships of Ferretti Group, a world leader in designing, building and marketing luxury motoryachts with a unique portfolio of the most prestigious and exclusive brands in the nautical world, were protagonists at “Convergence”. This professional master features training and refresher courses, and was held from 15th to 18th March at the Kempinski Palace Hotel in Portoroz, Slovenia. Now at its seventh edition, “Convergence” welcomed 130 participants from all over the world.. The meeting comprises an intense schedule of both classroom sessions and outdoor activities, and participants take part in refresher courses organised in collaboration with Ferretti Group Sales, After Sales and Communication Divisions, as well as its Product Development Division, one of the most advanced naval research and design centres in the world. Technical seminars were held by a number of speakers from the Group’s most important technological partners, amongst which MTU, ZF, Besenzoni, Condaria, Gianneschi, Idromar, Naviop, Rina, Rolla and Videoworks; companies which have always worked with the Product Development Division, and especially with AYT (Advanced Yacht Technology), to further and consistently innovate Ferretti Group yachts. Other seminars pertaining specifically to the role of the captains and their professional sphere regarding international rules, certifications and class for pleasure yachts, professional maritime qualifications, fuelling for private yachts and cruising suggestions in the Croatian area were also held during this four-day meeting. During the sessions, Group technicians and engineers, together with the lecturers, made an in-depth study of the main issues connected to the daily management of motoryachts. Expressly requested by the captains, one-to-one meetings were also held in dedicated areas with the managers of the After Sales & Service Division. To complete the technical activities, the captains were involved in exciting team challenges, making the climate of positive collaboration even stronger and also an important moment to meet and spend time with Ferretti Group. Ferretti Yachts, historical Ferretti Group brand which produces flybridge motoryachts measuring 15 to 27 meters, took part at the Copenhagen boat show “Bade I Bella” from 11th to 20th March 2011, through dealer Dreamline Yachts. Over the past few years, the Copenhagen appointment has registered a consistent increase in both shipyard and visitor numbers, setting it up as a new, promising, showcase for the nautical sector in northern and central Europe. This year, Ferretti Yachts showed its yachts at Bade I Bella, confirming its interest in this strategic market area. The latest model to be produced in the 50’ range, the Ferretti 500, is being presented to the Scandinavian market for the first time, but was originally displayed at the last international boat show in Genoa. In Copenhagen clients and visitors where able to go on-board the 500, evolution of the well-known 470, a bestseller in the Ferretti Yachts entry level range. The 2010 racing circuit was in full swing again this year—and Formula was definitely making waves. The #P400 Formulaboats.com 382 FAS3Tech did an outstanding job during the 2010 season with one first-place, two seconds, a third and a fourth-place title before the world races. The Formula 290 FX4 earned the Trailer Boats Excellence in Design Award in Styling for 2011. This boat was featured in the January 2011 issue of Trailer Boats magazine. Luxury motor yacht builder Gulf Craft, based in the United Arab Emirates, announced at the Dubai Boat Show a new partnership deal with Italian equipment manufacturer Quick Srl. Under the agreement, Quick will be the supplier of equipment for Gulf Craft’s new 95ft Gulf 95 EXP motor yacht with the concept of ‘comfortable living on the water’ at its heart. The Quick products on board include a twin anchor handling system, hydraulic bow and stern thrusters – complete with a specially developed central control system – Quick SS 316 water heaters with a calorifier option, and a recently developed, full pop-up LED lighting system for the foredeck seating area. When not in use, these lights are retracted to leave an unobstructed deck area. Gulf Craft and Quick worked closely together on the development of the unique central, synchronized, combined joystick controller for the double anchor inch and both bow and stern thrusters. The arrangement of the bow and stern hydraulic thrusters, controlled from a single position on the bridge, will make it particularly easy to handle the Gulf 95 EXP when maneuvering in or out of marina berths and compliments the Gulf 95 EXP ‘art de vivre’. Quick Srl is headquartered in Italy where the company has been designing and manufacturing top quality marine equipment and accessories since 1983. The company has built up a strong presence in American quality boatbuilding, but is also distributed throughout the world. Quick’s navigation, anchor and general lighting division has devoted much of its research and design attention to the use of LEDs for lighting, either on their own or seamlessly integrated with conventional light sources. Quick manufactures all of its products at its own premises within Italy. Hunt Yachts has further extended their agent network with two new appointments: Ross Yacht Sales and Hampton Watercraft & Marine. Ross, founded in 1962, has twelve brokers in three new boat and brokerage offices in Florida, Tampa Bay, Ft. Myers and Naples; they will be Hunt’s exclusive representatives for the West Coast of Florida. Hampton, founded in 1990, will be Hunt’s exclusive agent for Long Island; they combine a full-service marina on the Shinnecock Canal with a showroom on the Montauk Highway in Westhampton Beach. The latest appointments bring to seven the number of independent Hunt agents in North America; the Company also has a sales office at their factory in Rhode Island and a recently launched satellite office in Annapolis, Maryland. Hampton Watercraft ranks #13 among Boating Industry’s Top-100 Boating Agents. They are certified as Master, Premier or Platinum level performers by other brands they sell and service. When a group of very experienced Tampa-based yacht brokers found they were all interested in the same concept, Ross Yacht Sales was established. “Owner contact” was the focus of their concept, and this has resulted in one of Florida’s most successful yacht brokerage companies. Looking for a brand of new powerboats that fit this approach led to Hunt Yachts. Hunt Yachts announces the opening of a sales office in Annapolis, Maryland. Located across Severn Creek from the Annapolis Yacht Club, Hunt Yachts Chesapeake will support the burgeoning number of Hunt Yacht owners in this region and serve the market’s growing interest in this iconic brand, renowned for its deep-V powerboats and motoryachts. Heading the new Annapolis office are Todd Taylor, one the region’s most experienced yacht brokers and dealers who has been associated with Hunt since 2003, and Bob Price, a successful businessman and experienced Hunt owner. Taylor brings nearly 20 years’ experience in yacht sales and brokerage including responsibility for many of Hunt Yachts’ sales in the Mid-Atlantic states. He is a long-standing member of the Yacht Brokerage Association of America (YBAA) and has served two terms on their Board of Directors. Todd was among the first yacht brokers to earn that organization’s “Certified Yacht Broker” designation. Todd has been around boats his entire life, had enough sea time to earn his first USCG Masters License at age 18, and held a 100-ton Masters License for many years while working as a professional captain and crew. Price, an experienced Hunt owner, is a practicing attorney and lifelong resident of Maryland’s Eastern Shore. Bob has been an informal member of the Hunt team on the boatshow circuit for the past several years. After years of sailing and racing one-designs, he moved to power but remains active in the sailing community: he is past Commodore of both Tred Avon and Corsica River Yacht Clubs as well as Rear Commodore of Cruising Club of America, Chesapeake Station. Hunt Yachts Chesapeake is located at 222 Severn Avenue, Annapolis. On March 9th veteran NASCAR driver Jeff Burton paid a visit to thank all the Jarrett Bay Marine Park associates who had a hand in his recently completed sportfishing boat. Jeff signed autographs and spoke with the nearly 130 employees of various companies during the barbecue lunch & meet-and-greet. Nordic Tugs started the trend of a tug as a family pleasure cruiser. Keeping up with that same level of innovation, the boat builder now installs SmartPlug 30 amp boatside shore power systems, making electrical connections safer and easier. The SmartPlug 30 amp plug and inlet protects against the leading causes of fire and electrocution, loose connections and overheating. The unique sleeve configuration nests the plug and inlet together, making aligning the pins a snap. Any pressure or force is absorbed by the assembly's body, not the electrical pins. SmartPlug is effortless to orient and connect, even in the dark. According to Maritimo USA President Dave Northrop Maritimo registered record sales at Miami Boat which came from every geographic region of the USA as well as the Caribbean and South America. The result follows on from a strong showing at Fort Lauderdale, Florida, in October last year. Mr Northrop said the company had approached the show “with cautious optimism”. Apart nice weather at the show Maritimo recently added HMY and Galati Yacht Sales to its team also played an important role. A great display, with two models being shown for the first time outside Australia, a 440 Offshore Convertible and C50 Sports Cabriolet hepled. Maritimo also showed a M56 Cruising Motoryacht - which sold at the show – and a 550 Offshore Convertible. He said the Maritimo stand had seen a 30 percent increase in registered visitor numbers over the previous year. Following the success of last year's inaugural event, Moonen is pleased to present the second Moonen Refits Lunch during the upcoming Antibes Yacht Show. A select group of captains, brokers, superintendents, yacht managers, owner's representatives and senior members of the press will gather on Friday 8 April from 13.00 to 14.00 in the restaurant tent at the heart of the Antibes show. There will be some delicious food and drinks available and the chance to network with your industry peers. In addition, Moonen Managing Director Emile Bilterijst will give a short presentation and will host a discussion on the subject of project management during refits. Together we will look at issues such as planning, financial transparency, deadlines, and the need for clear communication and teamwork. Plenty of food for thought in other words - and input will be more than welcome! As you may know, Moonen opened a second yard several years ago, which has allowed it to carry out a much wider range of refit work. Leading Midlands marketing communications agency, Connect Group, has been appointed by Numarine to reposition its brand. Istanbul-based Numarine has appointed Connect to develop a full communications strategy. The Wolverhampton-based agency’s work will encompass new brand guidelines, digital communications, dealer advertising and support materials, PR and exhibition collateral. Numarine was established in 2002, by Omer Malaz. The company has invested heavily in new plant and technology, and today makes some of the most technologically advanced and luxurious boats on the market. There are currently eight models in the range from 55ft to 102ft. A 130ft model is currently under development. The appointment of Connect comes on the back of a new CEO being appointed by Numarine - Patrik von Sydow. Alexander Marine, the manufacturer of Ocean Alexander yachts, is proud to announce the opening of the newest retail location in Sanya, China. The Chinese boating industry is rapidly growing and Chinese citizens are now enjoying the yachting experience and pursuing a yachting lifestyle. John Chueh, owner of Alexander Marine, recognized that developing luxury market and made investments to expand retail locations in China. With a total of four locations in Shanghai, Xiamen, Guangzhou and now Sanya – Ocean Alexander is the largest retail network in China under one ownership. To accommodate the growing clientele, the retail locations are authorized to sell Ocean Alexander, Luhrs and Marquis yachts. Since entering the Chinese market in April of 2010, Ocean Alexander became the fastest growing brand in 2010, in terms of units sold, revenue growth and number of retail locations. The Palm Beach 50, built by Palm Beach Motor Yachts in Australia, has been awarded Motor Boating magazines Best of the Year for 2011 at the Miami International Boat Show in Florida USA. Following on from being awarded Best New Power Boat in Show at the 2010 Newport International Boat Show in Rhode Island USA, this second award in less than six months has heralded the arrival of the Palm Beach Motor Yacht range of boats in the USA. Alan Paterson and the team from Princess Yachts Australia will be offering their owners and invited guests a truly relaxing and enjoyable experience during the 2011 Sanctuary Cove International Boat Show. Guests will be treated to a valet shuttle service from the Hope Island Resort Marina head office direct to the show. On arrival at the stand, guests will be welcomed into the stunning café style corporate facility offering food and beverages throughout the duration of the show. The Princess Bespoke Chef will be on hand preparing delicacies featuring premium local produce, while guests can sit back and relax in the casual dining environment surrounded by the immaculately presented range of the latest releases from the UK’s leading luxury boat builder. The 1500 square metre on-water display will feature a range of the most recent releases from Princess, all offering the latest design innovations and contemporary styling this prestigious brand is famous for. The V Series will be represented by the stylish and sporty V52 who will be making her Australian debut, the V62 which was awarded the 2010 European Motor Boat of the Year and both sitting alongside the truly awesome V85-S. The ultra sleek and stylish Princess flybridge range will be represented by the very latest Princess 64 and the amazing 72 Motor Yacht. Princess will also host an exclusive function for their owners and invited guests on the Saturday evening of the show. Princess is partnering with Calleija Jewellers to present an extensive range of their latest exquisite jewelry creations, set to the backdrop of the stunning Princess range. A presentation of the Calleija Princess White and Princess Pink diamonds will be a highlight of the evening. Riviera, Australia’s most awarded pleasure boat builder has recorded the best international boat show results in the past two years achieving eleven new boat sales and exceeding conservative expectations at the 23rd annual Miami Yacht and Brokerage Show. Director of Riviera Yachts Chris McCafferty said Riviera's new models had impressed the American market. Riviera entertained about 350 Riviera owners and enthusiasts at its floating display on Collins Avenue over two fun-filled nights. Live music, great food and plenty of cool cocktails set the scene for two nights of great entertainment and good company with the Riviera family. Riviera sales at Miami were two 43 Open Flybridges, two 5800 Sport Yachts, two 4400 Sport Yachts, one 5000 Sport Yacht and several flybridge models ranging 51 to 38 feet. These boats are bound for diverse boating destinations including, Massachusetts, Puerto Rico, Costa Rica, Miami, Lake Michigan, Seattle, Canada and Bermuda. As the sounds of a Spanish guitar and maracas filled the air, Ron Mussalli joined 40 Riviera owners on board ‘The Island’ for a Riviera Fiesta. Hosted by R Marine Sydney, the Spanish Riviera Raft Up was held at Athol Bay earlier this month. It was a hot, humid Summer’s day and as the temperature soared above 40 degrees, revellers enjoyed a dip in the inflatable pool. R Marine Sydney dealer principal Michael Joyce said the vision for the day was to create a relaxed, simple and easy flowing day where everyone could put their feet up and get into the Spanish theme. For Ron and his family, this was the first time they had attended a Riviera event and he said he looks forward to the next. Ron, a McDonald’s franchisee, owns a 51 Enclosed Flybridge which he named Fry Girl. He bought Fry Girl in August 2010 and said his family enjoyed boating adventures around Sydney, Darling Harbour and up the Hawkesbury River. Michael said R Marine Sydney’s Raft Up events always proved popular with Riviera owners who enjoyed the chance to socialise and catch up with other boat owners. Riviera, Australia’s most awarded pleasure boat builder has teamed up with Riviera owner Peter Teakle for the annual Riviera Port Lincoln Tuna Classic. The two day fishing event has already attracted teams from interstate and abroad and with a limit of 20 boats in the tournament, organisers are encouraging early nominations. Event organiser Peter Teakle said schools of Southern Bluefin Tuna have already been sighted in the competition area. Port Lincoln has some of the best game fishing and cruising grounds in Australia and is home to the Southern Bluefin Tuna. With its close proximity to the Spencer Gulf and the Great Australian Bight, Port Lincoln is a prime location for the annual Riviera Port Lincoln Tuna Classic. A fleet of Rivieras travelling in convoy for R Marine South Australia’s Port Lincoln Owner Experience will depart Adelaide on April 21 bound for Port Lincoln. R Marine South Australia will host events such as a welcome dinner, beach party, sight-seeing helicopter rides, Harley-Davidson motorbike rides, and barbecue breakfasts before the fleet returns on April 25. However, keen anglers among the fleet may choose to stay on for the annual Riviera Port Lincoln Tuna Classic which starts a few days later and therefore a second date of May 2 will apply. There will be a range of trophies including one for the heaviest Southern Bluefin Tuna, highest point scoring boat, highest point scoring trailer boat, highest point scoring male angler, lady angler and junior angler. This year’s tournament is the beginning of a new era for this event where the aspect is on family fun, education and sustainable fishing. An event not to be missed by keen anglers, Peter Teakle is urging competitors to get their nominations in early to avoid disappointment. Entries must be received by April 21 to ensure participation in the Riviera Port Lincoln Tuna Classic 2011. A welcome night at the Marina Tavern will held on April 29 followed by the two day tournament on April 30 and May 1. The Presentation Dinner will be held on May 1 at the Marina Hotel and bookings are essential. Buzz Lightyear and Sheriff Woody, on board a new 43 Open Flybridge aptly named ‘Bullseye’, led the fleet of 28 Rivieras as they completed the formal sail past, which marked the beginning of the annual R Marine Perth Variety Splash. In its second year, R Marine Perth’s annual Variety Splash has grown significantly with 131 adults and 30 children participating in this year’s event, raising about $150,000. R Marine Perth dealer principal Brendon Grieve said the Variety Splash had become one of their biggest calendar events. Jennifer and Greg Ferguson chose ‘Beverley Hillbillies’ as their theme. R Marine Perth’s annual Variety Splash began with the formal sail past and leading the fleet out of the harbour was the Fremantle Port Authorities Fire and Rescue on board Response. The fleet celebrated the first night with a cocktail party at Dolphin Quay in Mandurah before heading further south to the Margaret River region where they were treated to the Michael Buble concert at Sandalford Winery. Variety WA began in 1980 and has since raised more than $20 million to enrich the lives of children who are sick, disadvantaged or have special needs. Confirmed the presence of the Italian Shipyard at the Hainan RendezVous and at the Singapore Yacht Show Sanlorenzo, the prestigious Italian Shipyard that from over 50 years produces tailor made motor yachts matching the style and requirements of each owner, confirms its strategy of expansion in the Asian markets, characterized by an impressive economic growth. After the recent participation at the PIMEX of Phuket, in Thailand (Phuket International Marine Exhibition), center and crossroads of the Asian South East yachting with a strong presence of harbors and infrastructures able to welcome medium to large yacht sizes as the Sanlorenzo yachts are, the Italian shipyard will attend the next two main events of the Asian area: Hainan in China and Singapore in the Malayan peninsula: Hainan Rendez Vous (April 1st – 4th ): it is Asia’s first and only exhibition dedicated not exclusively to large yachts, business jets and luxury lifestyle, and will take place in the Sanya island, tourist destination of the Chinese upper class for its typical sceneries of tropical island. Singapore Yacht Show (April 8th – 10th ): it is the only Asia’ show exclusively dedicated to super yachts (+30 meters) that takes place in Singapore, financial economic center of the South East region, that has one of the most operative and well travelled harbor in the world and neuralgic center of the Oriental commerce. Sanlorenzo continues to export the top level tailor made yachting in Asia, aiming at the growing number of admirers keen about Italian products as at the best expression of the luxury “Made in Italy”. One of the largest boat shows in France starts this weekend and our Sealine Cote d’Azur team will be showing the Sealine 35 Sport and the award winning SC35. The La Ciotat boat show is running for 9 days from this Saturday until Sunday 20th March. A popular, inclusive event, the La Ciotat boat show is the showcase for everything nautical in the Marseille Provence Métropole region. It is the leading springtime in-water boat show in France and the Mediterranean. A showcase for the latest technologies and good practices in eco-friendly sailing, marine environmental protection and sustainable development, this show offers something to anyone that loves the sea. Launched in June 2008, the 70 Sunreef Power JAMBO is a rare example of a luxury medium-sized power yacht 60-80 feet with extremely low fuel consumption, trans-Pacific range and top speeds reaching 20+ knots. This exceptional yacht was conceived by Sunreef Yachts with the help and advice from Laurent Bourgnon, a famous sailor with a wealth of experience in catamaran regattas. This expedition power catamaran JAMBO was designed to undertake round-the-world trip in the most comfortable conditions and using the lowest amount of fuel possible. 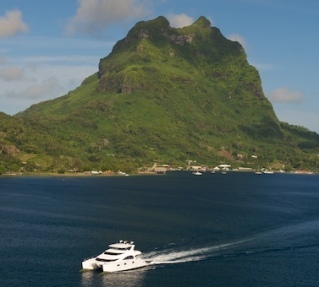 The yacht is currently cruising around Raiatea, French Polynesia, where the Bourgnon family has been settled for a while and enjoys the relaxed local lifestyle. The fuel consumption was originally 13 litres/ hour/ engine at 10 knots at 2,300 RPM. Following structural and technical modifications made by Sunreef Yachts (installation of water bulbs of 5.5m, and additional aft swimming platforms, increasing the JAMBO’s LOA to 85feet) and other companies (remapping of the engines for optimal use, and new sustainable and smooth antifouling), these numbers have been significantly reduced. The consumption now is 7.5 litres/ hour/ engine at 10 knots at 1,500 RPM, or 15 litres /hour! Tecnomar attended the 4th Mumbai International Boat Show cementing the company's permanent presence in India and setting its expansion plans in Asia. In the most admired exhibition stand, Tecnomar unveiled the brand new NADARA 45-metre full beam, the world’s largest and fastest tri-deck planing yacht currently under construction at the Tecnomar premises in Massa-Tuscany. This stunning super yacht combines comfort, state-of-the-art technologies, high performance and elegance to create something unique and exclusive. Tecnomar Shipyard was established in 1987 and, over the years, it has become one of the top Italian players in luxury yacht building field, selling over 270 vessels. Since January 2009, Giovanni Costantino is the Chairman & CEO, who implemented an intensive corporate and structural restructure plan. Today, in its 15,000 sq. metre production plant located in Massa, Tuscany (Italy), the company produces custom made luxury yachts ranging from 60 feet up to 60 metres, fully personalized according to the Shipowner’s tastes and requirements. These are the topics of the new fleet by Tecnomar: 19 models, 3 lines in steel & aluminium, 2 lines in composite material and a brand new sailing line. Design & trademark of models and product lines are regularly registered. Sunseeker International Ltd have over the last few months been tendering our security contract for all nine sites across Dorset and Hampshire. We are pleased to announce the appointment of Eagle Hoburne Security Services Ltd who will take over the contract on 26th March 2011. The Eagle Hoburne bid team led by Rick Ashton (Managing Director) proved professional and pro-active through out the tendering process and demonstrated their ability to meet the complex and difficult requirements of our production sites. The appointment will improve the level of security service provided and ensure that security is clearly evident across all our sites. A group of 18 children from K3 at Phuket International Academy (PIA) recently visited Ao Po Grand Marina along with their teachers, to take a tour of a Sunseeker Manhattan 60 motor yacht. Hosted by Craig and Supranee Murphy, the Managing Directors of Sunseeker Thailand, the children took time away from school to not only step onboard this beautiful yacht, but to also learn about boats and how they work from a very experienced boat builder and Master Mariner. Teachers from PIA, Sutarsinee Suanplee and Mida Abdul sent thanks to Sunseeker Thailand for the opportunity to visit such a beautiful Yacht, the content of the day and the hospitality both they and the children received. Sunseeker Middle East LLC & Sunseeker Seychelles Ltd are proud to announce their marketing & sales alliance for the Islands of Seychelles. At the recent 19th Dubai International Boat Show both companies jointly introduced the Seychelles to clients of the Gulf region. In the past year, clients from this area have already detected the Seychelles as a "paradise for yachting" that can be reached within 4 hours and 20 minutes by air, either through Emirates Airlines from Dubai, or with Qatar Airways from Doha, offering daily services into Seychelles. Sunseeker clients can own a lifestyle in Seychelles at the new Eden Island Marina and enjoy cruising the turquoise waters around Seychelles' 115 islands. The granitic and coralline islands offer spectacular views and the ocean's abundance make great yachting and diving experiences. Around 400 rally fans gathered around the Bournemouth Pier Approach on Saturday the 26th of Feb to witness winners David Bogie and Kevin Rae from Scotland celebrate their podium victory with the traditional champagne spray. They came 21.8 seconds ahead of Tom Cave and Craig Parry in the JRM Mitsubishi. The annual race contributes an estimated £680,000 to the local economy with 11 stages around Ringwood, Wareham and Verwood. About 6,000 fans also saw the Opening Ceremony parade at Poole Quay on Friday night, which showcased High Energy, a stunning 88 Yacht, courtesy of Sunseeker Charters. Selected VIP and Sponsor partners got the opportunity to go onboard and have an exclusive guided tour of the spectacular yacht. At just under 90ft, this brand new £4.5 million vessel is the largest and by far the most luxurious vessel of its kind available to charter in the UK. On the race day on Saturday, cars reached more than 100mph on fast stretches like the newly redesigned Somerley Park stage, but morning rain and mud made conditions difficult. Bournemouth's Mayor Barry Goldbart, a rally enthusiast who used to race as a young man, welcomed drivers at the finish ramp by the Bournemouth Pier Approach from 5.30pm onwards. Tiara Yachts, a division of S2 Yachts Inc., has selected Garmin to be an OEM electronics supplier to outfit its line of luxury fishing and cruising yachts. Tiara Yachts, a division of S2 Yachts Inc., has selected Garmin to be an OEM electronics supplier to outfit its line of luxury fishing and cruising yachts. Tiara’s debut of the Garmin electronics package on three yachts at the 2011 Miami Boat Show was met with overwhelming enthusiasm from customers and dealers. Garmin’s user-friendly navigational systems deliver confidence in high definition. By providing important reliable data quickly, yacht owners will be able to interpret the information for safer navigation on the go. Tiara Yachts will offer Garmin’s GPSMAP 5000 and 7000 series MFDs; high-definition 6kW GMR™ xHD open-array radar scanners; GSD 22 digital sonar; VHF 300 marine radio; GHP™ 10 autopilot system; as well as the GMI™ 10 marine instrument display, which makes it easy to monitor navigation, heading and environmental data. The partnership with Garmin is a natural step in Tiara Yachts’ ongoing quest to lead the industry with innovative features, comforts and state-of-the-art technology. Wider 42’ World Wide Preview will take place on April 14th at 11.00 a.m. at Porto Carlo Riva in Rapallo (near Genoa, Italy). Tilli Antonelli will tell you about the development of this project and display a day-cruiser which conveys the concept of space and stability as never seen before. After a brief Press Conference at the Yacht Club Rapallo, inside the Carlo Riva Harbour Wider will serve a light lunch and delight you with Wider 42 sea trials. Windy Boats of Norway is co-operating with renowned yacht and private jet interior designers, Eidsgaard Design (EDL), on a stunning new interior vision for its latest generation of boats. Starting with the all-new Windy 31 Zonda weekender, the 40 Maestro highperformance family cruiser and the award-winning 44 Chinook hard-top sports cruiser, EDL have been charged with creating a distinctive new Windy interior aesthetic which combines contemporary design and fine craftsmanship with clean lines and luxurious detailing. The design concepts for the new interiors combine clean, neutral backgrounds with rich textiles accents, walnut floors and finishes, and signature stainless steel details. The first Windy 31 Zonda with EDL interiors will be available from April. The new look Windy 40 Maestro and Windy 44 Chinook will be available autumn 2011. Plans are also underway to transform the Windy 48 Triton, 52 Xanthos and 53 Balios.